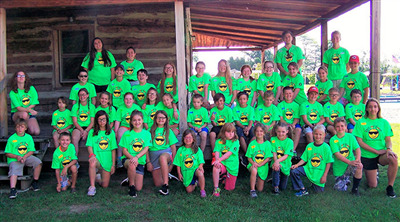 VAN WERT – Community Health Professionals (CHP) held its annual Rays of Hope day-camp for children and youth dealing with grief on June 26-28 at Camp Clay. Losing a loved one is never easy, especially for a child. CHP’s Rays of Hope Camp offers a place where kids can learn how to deal with grief. The camp had an emoji theme to reflect the many emotions that come with loss. The 50 campers who attended came from Allen, Auglaize, Mercer, Paulding, Putnam, and Van Wert counties, along with some from Indiana. They participated in crafts, games, group sessions, team-building exercises, swimming, rock climbing and zip-lining. The curriculum was accompanied by “The Healing Book,” written by Ellen Sabin. Each camper received a copy of the book in which they can journal, scrapbook and learn about various ways to express their emotions. Rays of Hope Camp is provided free through the generous support of the Noah’s Ark Fund, Alexander & Bebout, Calvary Evangelical Church, Convoy United Methodist Church Women, Mt. Pleasant United Methodist Women, Swan Memorial, Mox Nursery, Van Wert Service Club, Purmort Brothers Insurance, Van Wert Rotary Foundation, Wild Willy’s, Sycamore, Tom Stricker, Linda Stutz, Vantage Career Center, and anonymous donors. CHP also thanks Kevin Morrison of the Van Wert YMCA and the staff at Camp Clay for all of its support for Rays of Hope Camp.